(November 8, 2018) LAREDO, TEXAS - Eminent expert on economics and leading authority on U.S.-Mexico relations, Duncan Wood, Ph.D., spoke to a crowd of Laredo business and civic leaders on Thursday, November 8 about current issues and changes coming to Mexico. Wood spoke in Laredo, Houston, Brownsville and McAllen. His comments were streamed via video conference to customers in IBC Bank markets in San Antonio, Zapata, Eagle Pass, Del Rio, Dallas and Corpus Christi. IBC Bank Chairman and CEO Dennis E. Nixon, along with Executive Vice President Gerald Schwebel and Senior Vice President and co-chariman for the Texas/Mexico Trade Coalition Eddie Aldrete, organized the Duncan Wood speaking engagements; which included a conversation in McAllen with members of the Asociacion de Empresarios Mexicanos (AEM) and the Rio Grande Valley partnership and in Houston with AEM, and the Texas Association of Business. "As business leaders in both the public and private sector working in Texas, we should all be concerned about preservering and maintaining good working relationships with Mexico," said Nixon, as he commented on the timeliness of the presentation. "Duncan Wood shed light on what we can expect from the new government and how we can all work together. Our goal is to return value to our customers; we do that by keeping them well-informed with forums such as this one." Wood is the director of the Wilson Center's Mexico Institute. Considered a "North American citizen," Dr. Wood lectures widely at economic forums throughout the United States, Mexico and Canada sharing his expertise in economics, globalization, energy and the continuing negotiations on the former NAFTA policies; now called USMCA. Celebrating it's 50th year, The Wilson Center was created by congress in 1968 as a non-partisan think tank with a mission to advance understanding of the world and U.S. relations with the world. 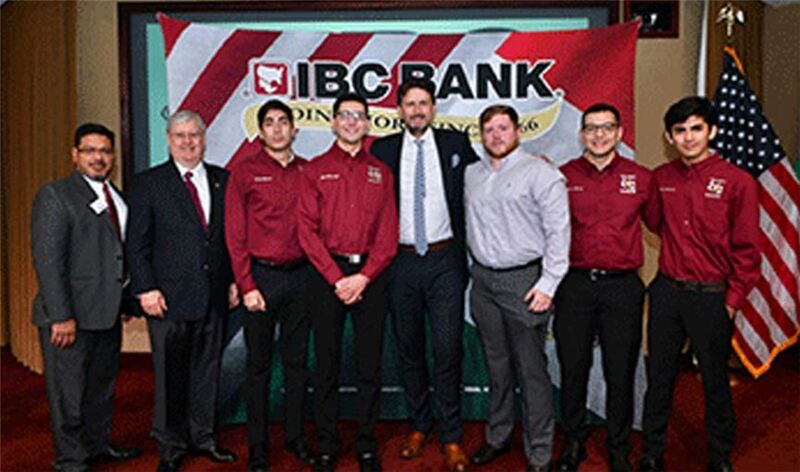 IBC Bank and Commerce Bank are divisions of International Bancshares Corporation (NASDAQ: IBOC), a $11.8 billion multi-bank financial holding company headquartered in Laredo, Texas, with 191 facilities, 288 ATMs serving 90 communities in Texas and Oklahoma. In 2016, IBC celebrated its 50th anniversary since opening its doors for business in 1966. IBC Bank's slogan "We Do More" reflects the bank's dedication to the growth and success of both the customers and the communities it serves. International Bancshares was ranked 19th on Forbes' prestigious list of 100 Best Banks in America in 2018. MEMBER FDIC / INTERNATIONAL BANCSHARES CORPORATION. Follow our Facebook page, @IBCBankWeDoMore. More information is available at ibc.com.